What’s up guys! Today at Shibga Media, we’re gonna be talking about the golden question for the third video in this series, and that is—Does Google Maps Work? It’s a golden question. Is this all a fluke? Do you actually get results from it? If so, how much can you expect? What kind of return of investment can you get? And so, I’m gonna break it down. 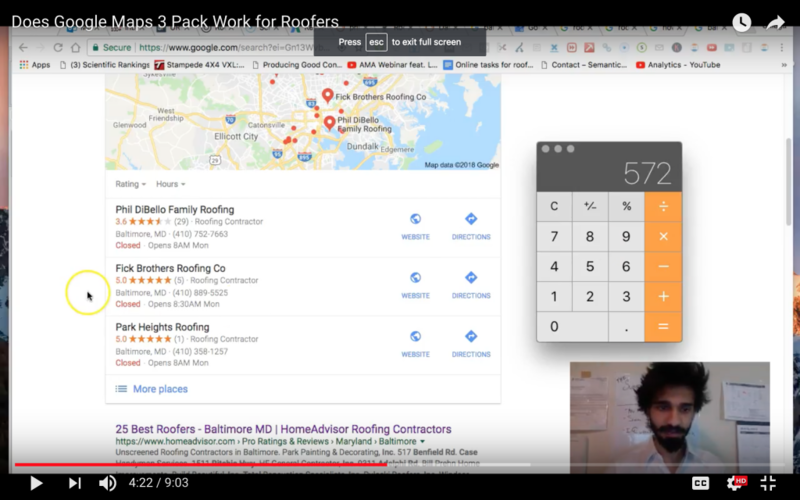 Feel free to watch the video because we are obsessed with Shibga Media Roofer SEO package. So, an example I gave early on in this…not early on, right here was a conversation with roofing salesman. Basically, I asked him, what are the two most effective ways you can get a return on your investment for your efforts, right? In the roofing niche right now in 2018. And he said two very different things. One is door-knocking, which makes sense. A lot of people hate to do it. It’s not maybe the best. If you’re the business owner, it’s probably not the best, what do you call, like the use of your time. You should have people who are good at that and going out there doing that. But it just makes sense. If a storm just happened or it just hailed and you’re out there. If you have a reputation behind you and you can prove it or you’re good at talking. And you door knock all these houses that just got hammered. And you’re just like, “I’ll get up there right now. you will get and all that stuff.” You’re gonna get somebody to write you a check, right? That’s just gonna happen. It works. The other part of it, he said as well and agreed with me, is Google Maps. For a long time, everybody’s preaching organic, organic, organic, all of listings here. So for any of you, who are still unsure of what I’m exactly talking about, if you type in, roofing contractors ct, I’m talking about this position right here ladies and gentlemen. Not this. 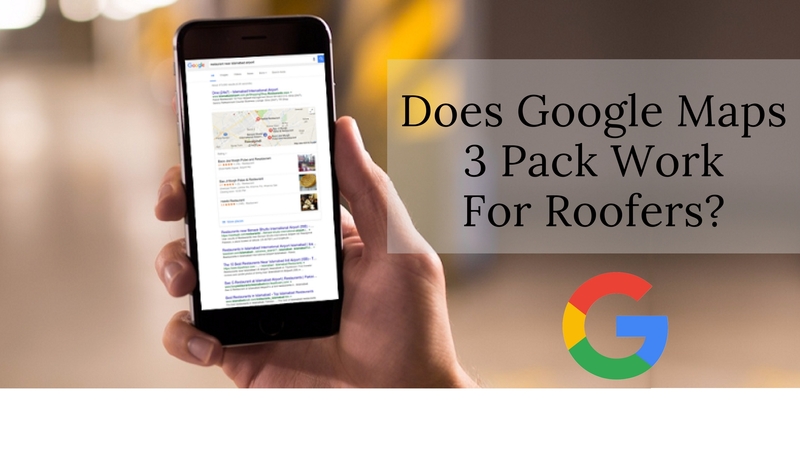 Bear in mind, the amount of Homeowners searching for roofing contractors in your city is a direct correlation between how well your Maps perform. So be sure to do proper roofing keywords. 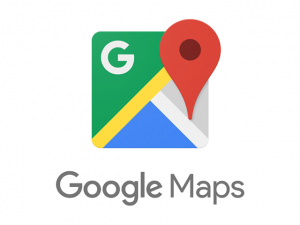 Google Maps – The Way To Go? This is what the new direction, right? It says, 65% of the people who make local searches in any search where the maps come is local search. For example, if I type in, how to tie my shoes, it’s not a local search because no maps come up. No maps will come. Videos come. Organic comes. But anything where the local business is involved, 65% off the traffic more or less will pick somebody from the maps. Let me say that again. Out of the people that make the search, you look at how many people are searching it and you can say roughly 65% of the people will pick somebody from the maps. So from the calculation point of view, it looks like, how many people are here, 480. 480 x .65 = 300. Over 300 people is going to interact with somebody in the maps. Now, all things being equal, you should get a clear 33% off should go to here, 30% should be here, 30%, but that’s not reality. In reality, nothing is equal. One of the biggest thing that’s going to sway the person who’s gonna get more attention than the other two is going to be reviews. The other thing which I actually don’t a lot of times admit is your reputation around the area. If somebody has seen you before, heard about you before, things like that, then most likely that’s going to sway them to click on. Right? People even without knowing a lot of times will go to a business that they have heard, seen, known, mentioned about before. Right? And if you are that kind of business with the most reviews, I mean, that’s something you can’t really control, right? What I’m talking about, it’s good to know. What you can control is the amount of reviews you have and actually being a selection up here. Take a look at how your Maps Visibility Fits as a puzzle for your entire roofing company marketing campaign. So let’s take a look at the numbers. Now, going back to our classic example that we’re gonna be using for all of our examples is Baltimore. Roofing Baltimore. What a great city. Let’s type that in and you’ll get… This word, oh no, the one we wanted is Baltimore Roofing because it has more search volume. Let’s do that. It makes it more interesting. This word has 880 people searching for roofers around Baltimore every single month. So bear with me, and just go with this. About 65% of this percentage will do something with the maps. Right? So we’re looking at literally over 500 people is going to interact and pick somebody from the maps. So the question is once you’re a selection, what kind of tangible results can you expect? Calls, visits to your roofing website, things like that. So I’ll give you an idea of what you can, right? For example, this person is at the top. This person is second. This person is third. But as long as you’re in the top three in our test, in our understanding, in our experience, it doesn’t really matter. For example, if you’re in the top three here, if you’re here compared to here, it will make a massive difference, absolutely massive difference and I’ll show you that later on in charts, how many people encountered the first listing. But when you are in the maps, people will literally go through and check it out of it. Why? Because there’s other stuff that matters to them more than just a placement since they can see all of you, they wanna look at reviews, maybe they wanna look at your portals. I mean, why don’t we have one right now here. Check out our guide to generating reviews for roofing contractors. When we look at the same thing, look at the layout. You can see it in my screen and you can call it. You can look at the reviews, you can check out previous photos and all that stuff is available to you right then and that, right? So a portion of the people depending on where they interact with, who they choose is going to click website, a portion will give you a call right then and there. The main thing you want them to take. But in roofing industry, most people want to click directions, because most people don’t just show up at your house, I mean, show up at your office and say, “Hey, I need a roofer.” They call you first, right? So we are left between, you becoming a selection, getting the most review so you get a good amount of people actually interacting with you and then split between a good amount will go to the website and a good amount will give you a call. when I say good amount, good amount and I am saying it so many times, how much are we actually talking about the numbers. So I’ll show you an example with roofers in Fairfield. Roofers in Fairfield. This word has 10 people approximately searching for roofers around Fairfield every single month. And it is one of the keywords we show up for. I think we show two more keywords for our client here, Valley Roofing and Siding. Just 10. Bear with me. Just 10 people. When we go into Google Maps Business dashboard, Valley Roofing and Siding, and I click on Manage. So you can go do this as you see mine. You’re actually able to see it right in your dashboard, how many people are interacting with your business. Insights. Scroll down to the bottom. This month we got 2 calls. So 2 people clicked that button right there. Right off the cellphone. Most probably cellphone. Most people are on their cellphones. Over 70 to 80% of your customers will be on their cellphone. So I’m guessing right from the cellphone, whatever it is, two people call them in the last quarter. This is relatively a new listing. 4 people called. Okay. Just from ranking for a few keywords that has ten to twenty people searching for it per month. So just imagine. I’m not gonna put any numbers out there. Just try to think. For a place like Baltimore eight where there is 880 people searching for one keyword, what kind of interaction can you expect if you are up here exactly? So that should answer does it work. Is it worth going for? That should answer it right there, giving you half search volume of your city. So that being said, now there are for our client, the main listing we’re going for is right here actually. I just wanna show you guys. For all of Connecticut, we have two locations. One in Fairfield, which I just showed you. The Connecticut one has 480 people searching and it’s up here. Unfortunately, our client didn’t feel showing insights for the main location and what’s going on in the Google Business dashboard, so I’m not able to show that. But I can assure you it’s a good amount of people, much more than 2, 3 people calling from the maps. Okay? It’s pretty big number. And yeah, so hopefully, that make sense and you all know what kind of leads you can get directly from Google when it comes to it. These are not shared leads. These are people who check you out and then call you. Usually, tend to be pretty good leads. Is Google Maps Worth It? So yes, it’s worth it. In our book, it’s damn, damn worth it. And, if you’re somebody who have been following me with the numbers, you would agree with me. Check out the Youtube video for a better visual representation and see you in the next post!